A Learning to Learn camp can accommodate up to 100 (or more) students. The facilitation team for a camp consists of a lead facilitator from Pacific Crest and two or three co-facilitators from the host institution who will be trained to lead future camps. In addition, there are a group of coaches who are responsible for 12-20 students who comprise a “learning community” within the structure of the entire camp community. 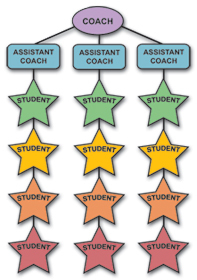 Each coach has 3 to 5 assistant coaches who are responsible for a “team” of 4 or 5 students. This large staff, with a ratio of three students to one coach is highly desirable in order to maximize the camp experience. Coaches are mostly from the host institution but Pacific Crest can assist with recruiting coaches from other institutions as needed. Learning to Learn Camps are typically 5 days long and run from 8:00 a.m. to 5:00 p.m. for non-residential students (8:00 a.m. to 8:00 p.m. for residential students). Past camps have usually been scheduled during the summer months; a popular period is the time just prior to the start of school.